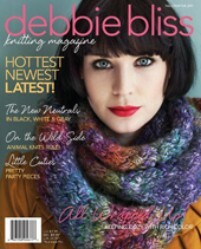 A fantastic collection of 26 new patterns using Debbie Bliss yarns, along with features to read which include an article on "Make Do and Mend" from the 2nd World War. Knits to Give : Treats for men and dogs! The cover basketweave scarf pattern uses 7 balls of Riva in colour 02, Heather, and you will also need 8mm needles and a cable needle.